Very early in the morning, the chief priests, with the elders, the teachers of the law and the whole Sanhedrin, reached a decision. They bound Jesus, led him away and handed him over to Pilate. "Are you the king of the Jews?" asked Pilate. "Yes, it is as you say," Jesus replied. The chief priests accused him of many things. So again Pilate asked him, "Aren't you going to answer? See how many things they are accusing you of." But Jesus still made no reply, and Pilate was amazed. "Do you want me to release to you the king of the Jews?" asked Pilate, knowing it was out of envy that the chief priests had handed Jesus over to him. But the chief priests stirred up the crowd to have Pilate release Barabbas instead. Jesus, having already been arrested and accused by the Jewish authorities, now stands before Pilate, the Roman representative in Jerusalem. 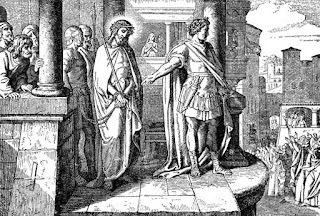 Pilate looks to deal with him as he would with any other criminal, by prying out of him a reason for him to be crucified. Rome was good at this kind of justice. They were very good at justifying their harshness under the guise of Pax Romana by finding in their victims something that stood against Rome. Pilate took Jesus in for private conversation so he might hear it for himself. If Jesus were to defend himself, Pilate was an expert at coercion and would find fault in his defense or else find something in his defense to hold against the Jewish authorities, making both Jesus and the Jews look foolish. If Jesus' defense would have been, "yes, I'm a revolutionary" then Pilate would have no trouble sending him to the Crucifixion stake as an example. If Jesus' defense would have been "no, no, I didn't do anything, I'm harmless to Rome and to the welfare of the city," then Pilate could make the Jews look silly and Jesus look like just another harmless Rabbi. But Jesus said nothing but an affirmation, "it is as you say." Perhaps Jesus tone was that of sincere affirmation "Yes, I am the king of the Jews but not in the same way of which I am being accused." Or perhaps his is a sarcastic response, "yeah, sure, I'm the king of the Jews, don't I look like a king?" as he stands in chains, possibly bruised and beaten from the previous night. Either way, Jesus' response does not serve as any kind of defense and so Pilate has nothing to work with. Jesus remains silent before Pilate, unresistant in one way but profoundly resistant in another, like a lamb before the slaughter yet like a prophet challenging the authorities. And Pilate, Rome's representative, stands amazed at the man standing before him. Jesus' silence leaves Pilate on his own, naked and ashamed. Refusing to side with either the Jews or with Rome, Jesus puts Pilate and Rome itself on trial. What will Pilate do? Can Pilate serve justice when there's nothing in it for him? Or will he be revealed for what he and Rome truly are, incapable of serving justice to those without a voice. Jesus stands silent in the gap, between Rome's sword and Israel's disobedience, defiantly silent. As Pilate does the only thing he knows how to do, searching for peace by way of bloodshed, he offers to the crowd (which may indeed have been filled with Barabbas' zealot supporters) another revolutionary, a violent one named Barabbas, to be released to them in Jesus' place. Jesus, still silent, reveals the hearts of the crowd as they cry out for violence, as they choose an impostor, a militant zealot, over the Prince of Peace, a pattern which Israel had chosen continuously throughout its' history. The Crowd cries "Crucify him," not realizing that it was Israel herself whom they were condemning to death. And Rome through Pilate hands him over to death not realizing that the justice being served was the injustice of all time being put on display for what it really was and is--incapable of defeating the God of peace and love. Jesus through his silence makes a mockery of the Powers that be, revealing both Rome as a hypocrite and Religious Israel as inadequate as from the vantage point of the cross, Jesus ushers in a new Kingdom, the New Israel, the way of peace through sacrifice, the way of justice through forgiveness. Jesus silently opposes sin and oppression.